American trends typically reflect European styles as it relates to fashion, design, and architecture.It’s no surprise to learn that Living Walls originated in Europe too. Specifically from the work of famous landscape architect Patrick Blanc who is now world renown as the mastermind behind the Vertical Garden System, a living art. Before Blanc, wall design was limited to forms of art like paintings, photos, mirrors and sculptures. All of which remain static and provide very little benefits outside ofthe aesthetic it provides. This all changed after the introduction of Vertical Gardens, also knows as Living Walls or Green Walls. Living Walls opened the doors for interior designers and allowed them to maximize the creative potential and overall benefit of an indoor or outdoor space. Made with either 4” or 6” plants, Living Walls allow designers to transform a room by filling it will oxygen and positive vibes. The challenge when designing a Living Wall is to find a way to align the overall look and feel of a room with the plant design. We have found that most of our client’s Living Wall requests fall under two categories: A clean contemporary design, OR a more traditional design with lots of flow and colors. Between these two designs, the possibilities are endless! Traditional Living Wall by Plantscapers Inc.
You may be wondering, what’s the point of a Living Wall other than it looking cool and filling up dead space? 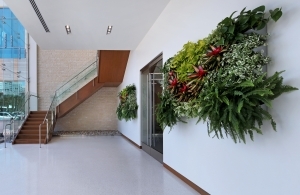 The benefits of a Living Wall reach well past the physical appearance of the design. 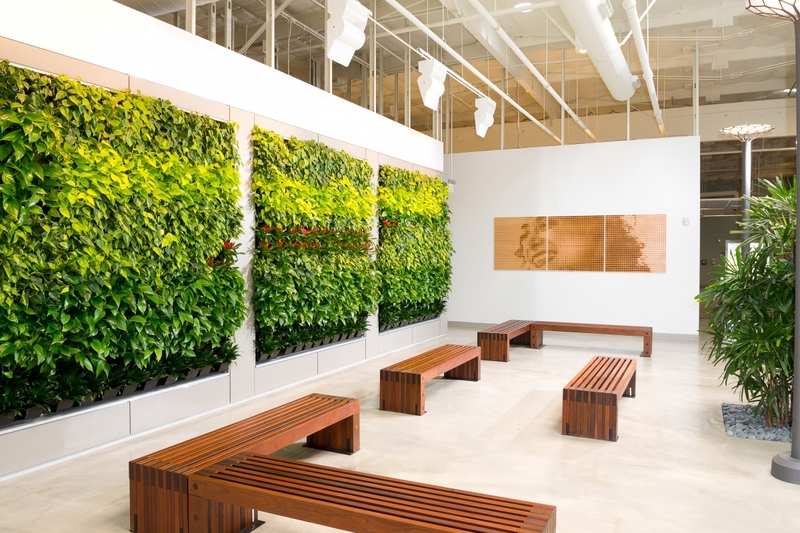 Plain and simple, Living Walls make people feel better by lowering stress and enhancing productivity on a daily basis. First, Plant Walls do a great job at absorbing sound and creating a soothing environment. Second, they naturally remove any pollutants in the room and give off high-quality Oxygen, which is something we all need. Third, Living Walls allow us to stay connected with the nature while we live our indoor lives. This phenomenon is know as Biophilia, or the human’s subconscious desire to connect with the environment and outside world. Design and Installation by Plantscapers Inc. 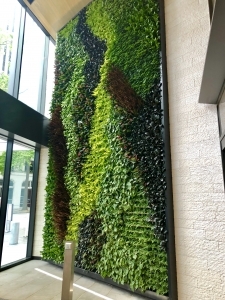 Whether you are interested in designing a corporate office, restaurant, home, or social space, a Living Wall will not only enhance the beauty of your space, but provide benefits as well. A local interior scaper can find the right Living Wall for your needs. Larger walls require some pre-planning and a built-in water source behind the wall. However, smaller walls around 8’x6’ in size require little planning and no water source. It is highly recommended to find a local interior plant design company to design, install, and maintain your wall. For those who don’t want to water the plants on their own and don’t want to hire a plant service, we offer moss/replica walls as well! 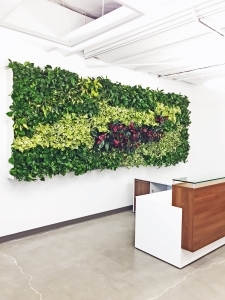 Contact your local interior plant designer for more information on how you can bring positivity and inspiration into your space with a Living Wall. You will be the talk of the town! Biophilia – What Does It Really Mean?